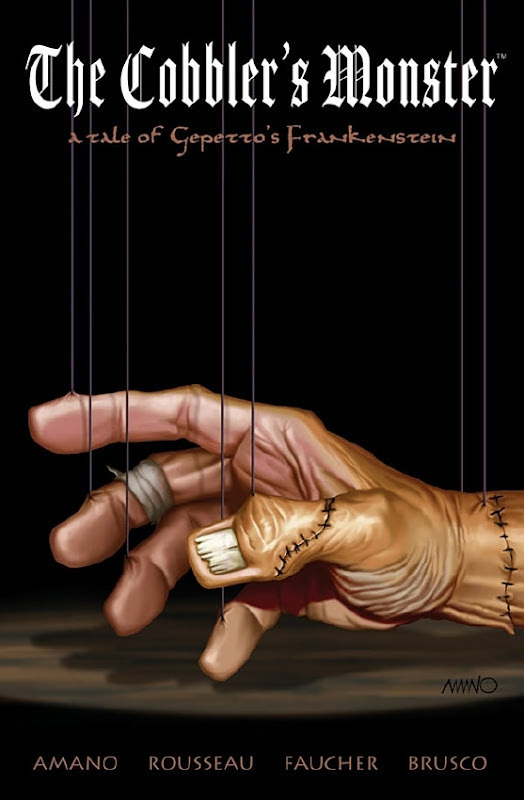 I posted, previously, about a gruesome reverse-Pinocchio story by Ausonia, a Frankensteinian take on the famous children’s classic. Here, the Frankenstein/Pinocchio connection is more conventionally explored. 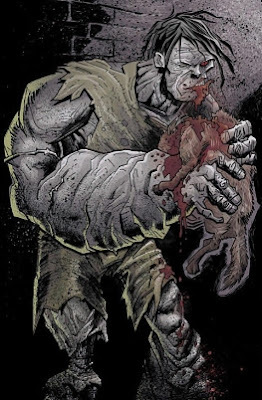 Written by Jeff Amano and illustrated by Craig Rousseau, The Cobbler’s Monster: A Tale of Gepetto’s Frankenstein fuses elements from Mary Shelley’s novel and Carlo Collodi’s Pinocchio, with a bit of Golem lore thrown in. In this story, set in America of the late 1800s, Gepetto saves the life of his dying son through DNA manipulation and an ancient Kaballah ritual. The result is a rampaging monster and the father, a la Frankenstein, must hunt down his transformed son. You can sample some of the artwork, fourteen pages worth, on Newsarama. Detailed reviews appear on Read About Comics and Independent Propaganda. The full-color, 128-page graphic novel was produced by Beckett Entertainment and published by Image Comics in 2006. It is available through The Frankenstore. The Frankenstein Push Puppet seen in the Nov. 10 "Bag Head Frankenstein" always looked like a monstrous version of Pinocchio to me! Interesting mix of ideas; I wonder how well they blend on the printed page?